I don't know about you but these days I'm starving for jelly! Luckily I have just the right indie polish "fixings" to whip up a very lady-like sandwich. Yum, yum, yum! But to make a good sandwich you need some great glitters and I chose two awesome ones. 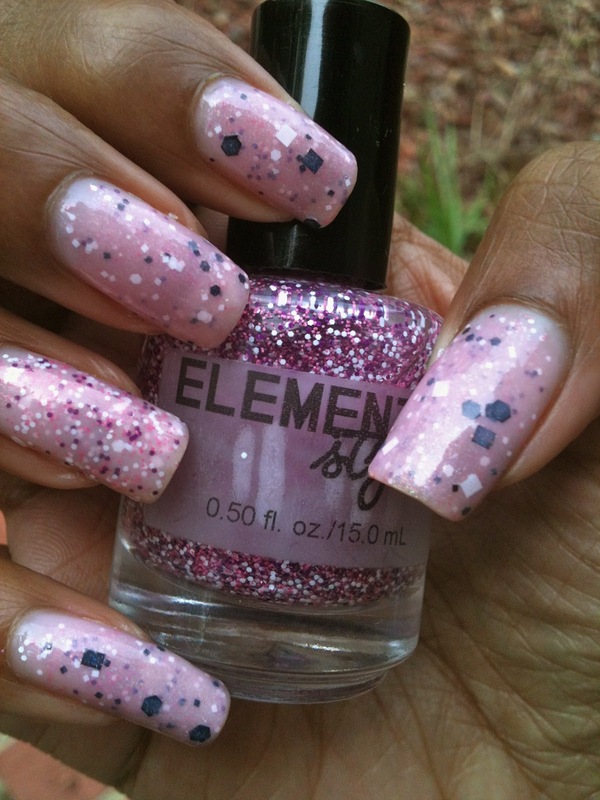 The first is Elemental Styles Xenon: Warrior Princess (50), a matte glitter polish consisting of magenta, white and dark pink small sized glitter. It has zero element of sparkle and all my love! Xenon gets a 10 for formula and ease of application - it's a winner all around. I also chose to use one of my newest Lush Lacquer polishes. Chubby Checker is gorgeous pastel pink glitter with loads of ultrafine holographic shimmer and small black and white squares, hexes and round glitter. Chubby gets a 8 for formula because it's a sinker. It's nothing that ten minutes upside down and a few shakes of the bottle can't fix, but I disliked how quickly the settling reasserted itself. Nevertheless the sparkle on this bad boy was fierce so 8/10 all around. 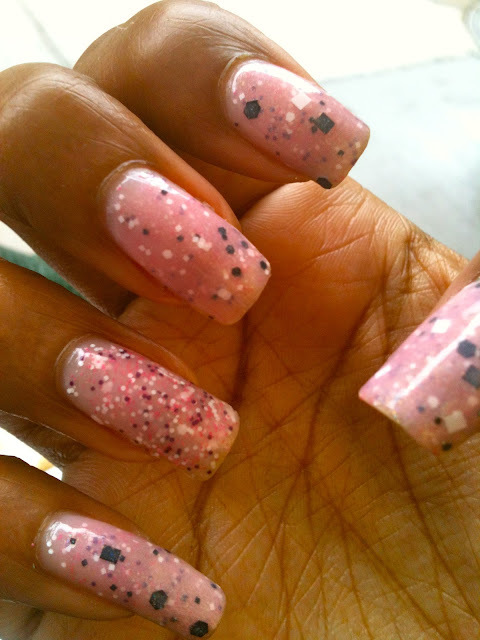 Finally for the the main ingredient I chose Essie's Sugar Daddy a very light pink super sheer jelly polish. My recipe: One layer of Essie's Sugar Daddy followed by one layer of Xenon. Then another coat of Sugar Daddy followed by a layer of Chubby Checker and finally one last layer of Sugar Daddy. For my ring finger I just put Xenon at the top and added a layer of CND Effects Copper Shimmer. This is outdoor lighting unfortunately when haven't had much sun so the light was low, but this is true to color. You can still see a bit of VNL even with so many layers, but I love how the hexes and matte polish peeps through sugar daddy. This is was shot indoors. Unfortunately I had a very hard time getting the lighting right and the pink here is much darker here than it actually is. What do you think? It's another first for me. I'm getting rid of an awful lot of firsts these days. Maybe I should change the name of my blog to Cherry Lockdown, but oh my what would the readers think?!? The truth is as obsessed with jelly polishes as I am these days I expect to be making many more sandwiches in the future. I'm on a quest to find lots of great jellies and since I have so many glitters they would come in handy. 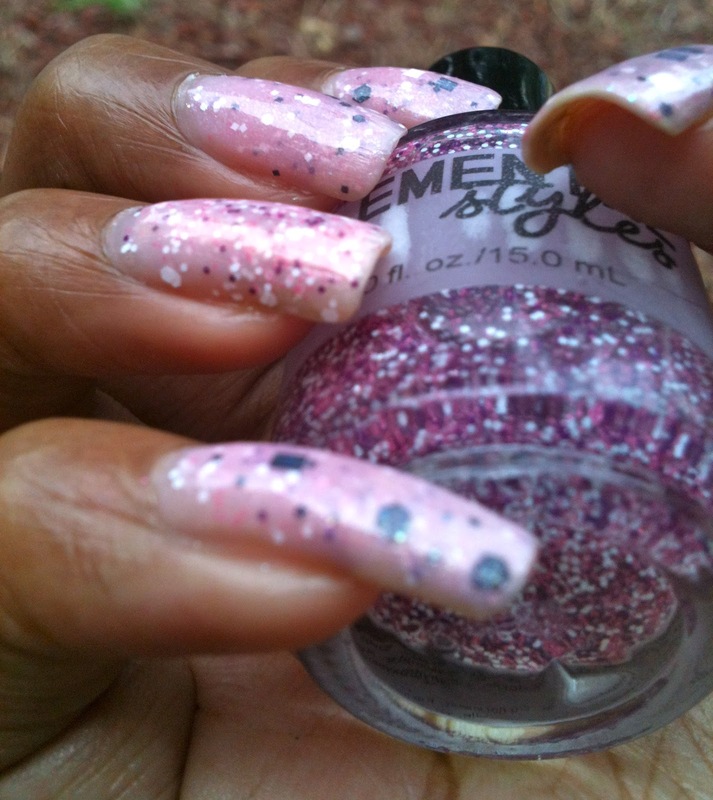 Do you ladies have any favorite jelly finish polishes? If you're interested in the glitters I used you can find Lush Lacquer and Elemental Styles on Etsy. Thanks for reading and for now I'll bid you adieu and bon appetite!